Make your grillz shine like brand new. We clean and polish it so it shines hard again. Get this done once a year to maintain your warranty. After you complete this purchase, please package your grillz up in a box and send it to Krunk Grillz, 2831 N Federal Hwy #11, Boca Raton, FL 33431. Make sure you insure your grillz in case it gets lost in the mail. Include a copy of your cleaning receipt in the box. 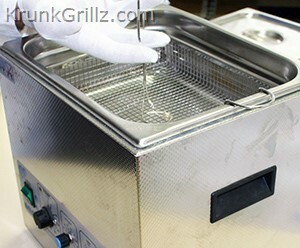 It will take 3-5 business days after we receive your grill to clean it. Then, we will ship it back to you.